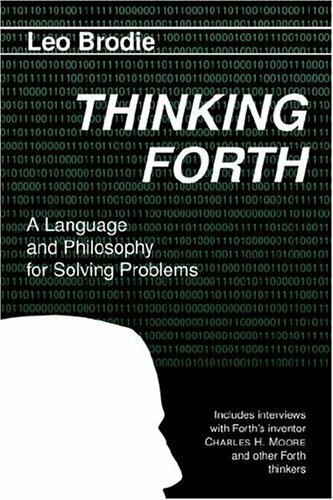 This enduring work is the only book to fully explore not just the semantics of the Forth programming language, but also the philosophy and style that is used by its most successful practitioners. Interestingly, this philosophy applies well to programming practice in any language. What is good Forth? What makes one Forth program better than another? Good object code is efficient in terms of system resources, it does not consume resources excessively. Good source code should be clear, easy to read and write, easy to debug. This book introduces you to modern Forth systems. It concentrates on introducing people who already know some programming to ANS Forth systems. The book includes examples of varying sizes, exercises, and some advanced topics. Forth is an unusual computer language that has probably been applied to more varied projects than any other. It is the obvious choice when the project is demanding in terms of completion schedule, speed of execution, or compactness of code. by Leo Brodie - FORTH, Inc. The classic Forth tutorial and textbook since its first release. Experienced programmers have commented on its concise utility and completeness, beginners will find a carefully planned introduction to the Forth programming language.